So I decided to take a break from my normal reading schedule and take part in the Pinterest Challenge that is hosted by Katie from Bower Power and Sherry from Young House Love. I love these two blogs because they challenge me to make this rental condo into a home, instead of the place we live for right now. I took on a small challenge this weekend because I had some other homie projects in the works that weren't so much the DIY - i.e. new duvet cover, new sheets, velcroing bed skirt to boxspring. My project was on the girlie side of things and it was quick and easy. 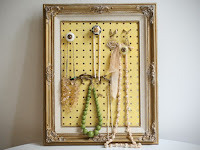 I have been wanting a way to store my jewelry to make them more accessible, so I will wear and love them more. There are two projects that I have in mind to accomplish this goal - one was completed this weekend and one is still on my wishlist. Here was my inspiration. I have figured out how I want to store my long necklaces, so stud earrings and potentially earrings in general was what I wanted to store. I went to my local thrift store and looked for a wonderful antique frame, but didn't find one. Then I went to our new Home Goods - WINNER!! I hate to admit I hadn't been there yet, WELP I will be back, what a gold mine for many things on the making a house a home list. I also went to my local friend Michael's for the rest of my supplies. ﻿I took the backing and glass out of the frame and cut the sewing fabric to size to more than cover the open space and tacky glued the sucker down. After letting it dry, I decided to attach a very pretty cream ribbon to hang the frame from the wall. The only thing that is left on my to do list, is to find a pretty door knob or cabinet pull to put up for it to hang from instead of the random nail situation we are currently using. And put all my earrings in!! Maybe an update picture soon to come! What do you think of the DIY post? Want to see more or back to the book business?